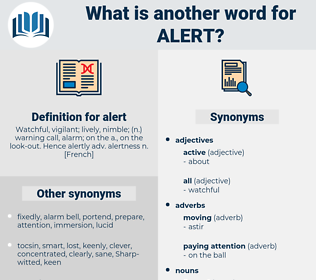 What is another word for alert? putting bug in ones ear. 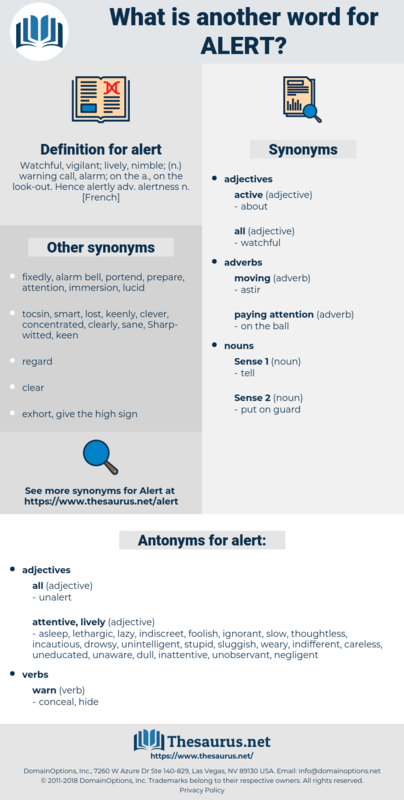 cautious, admonitory, observant, stand-by, wary, wake-up, attentively, alarming. informs, sensitise, recall, highlight, draw. warning, watchful, aware, alarm, sensitive, early-warning, responsive, conscious, cognizant, alarmed. warning, warnings, alerter, alarm, alarms, preparedness. warning, de-alerting, alarm, early-warning, lookout, preparedness, wariness. asleep, lethargic, lazy, indiscreet, foolish, ignorant, slow, thoughtless, incautious, drowsy, unintelligent, stupid, sluggish, weary, indifferent, careless, uneducated, unaware, dull, inattentive, unobservant, negligent. half-baked, unintentional, sappy, quiescent, obtuse, thickheaded, wacky, opaque, harebrained, leisurely, creeping, poky, dawdling, crazy, impetuous, screwball, unsmart, witless, dippy, engrossed, inert, imbecile, unheeding, incognizant, crackpot, feebleminded, logy, crawling, dormant, imprudent, lowbrow, unintellectual, bold, daft, lagging, half-witted, dreaming, unwatchful, gormless, nonintellectual, dunderheaded, kooky, simple, unthinking, thick, senseless, unwise, unmindful, loony, tardy, Daffy, nutty, moronic, idiotic, unvigilant, cockeyed, slothful, brain dead, unresponsive, boneheaded, Weak-minded, inactive, quiet, empty-headed, dorky, inconsiderate, unplanned, pinheaded, daydreaming, slow-witted, softheaded, nonsensical, laggard, dreamy, unwitting, zany, insane, balmy, venturesome, birdbrained, rash, dillydallying, dotty, untaught, thick-witted, unhurried, dragging, simpleminded, dilatory, airheaded, dim, idle, regardless, injudicious, featherheaded, tomfool, cuckoo, lamebrain, doltish, lunatic, brainless, illiterate, dumb, unknowing, indolent, preposterous, lunkheaded, dim-witted, Chuckleheaded, asinine, heavy, unready, fatuous, mad, sleeping, fool, vacuous, inadvertent, absurd, poking, dense, bubbleheaded, soft, uninformed, faraway, unprepared.
" What I hope," remarked Shadrack, with a chuckle, " is that our pickets are sleepy - dreaming of a nice warm fire at home, instead of keeping on the alert. There was something alert as lightning in the girl. air alert, strip alert, red alert.